IWC, The Inclement Weather Contractor, provides snow plowing and ice removal service for commercial and industrial clients. We continuously monitor weather forecasts and changing storm conditions in order to provide our clients with a level of comfort to ensure that all of their snow/ice removal needs are being met. Commercial shopping centers and homeowners associations: contact IWC to secure your snow removal services for the winter ahead. 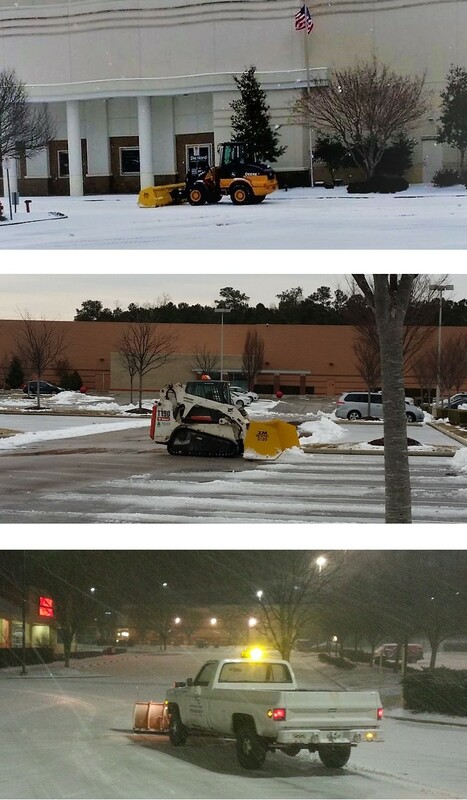 IWC plans to take on new commercial clients in Raleigh and the surrounding area for snowplowing, anti-icing and ice removal services this winter. Make plans now with IWC, so later you can rest easy knowing they will be ready take care of your parking lots, driveways and roadways as part of their regular rotation with every storm. Give IWC a call at 919-266-6671 for more info or to get signed up. Our fleet of inclement weather vehicles is ready at a moment’s notice 24 hours a day, 7 days a week. As an Ice B 'Gone Magic dealer we are able to provide professional, reliable service with superior results. We can apply anti-icing products ahead of time to keep ice and snow from bonding with pavement, improving traction for vehicles when precipitation first starts. If you're planning to prevent ice with salt or brine we offer anti-icing pre-treatment services. Let us help you get your melt going before the ice and snow become a problem. Ice B ‘Gone Magic (aka IBG Magic Granular & IBG Magic Liquid) is a highly effective ice melting product. It is highly effective down to -30°. Snow will “burn off” with no plowing. IBG Magic Granular works faster and lasts longer than traditional road salt, saving you up to 30%-50% in salt use. IBG Magic Granular is less corrosive, biodegradable and environmentally friendly. See why everyone is talking about IBG Magic!" Planning on spreading salt yourself? IWC can supply you with bulk road salt, whether you need normal white salt or salt that has been treated with Ice B Gone Magic liquid to make it nearly twice as effective by volume. Give us a call and Let us know what your needs are so we can help you get ready for the storms ahead.